Teddy Ruxpin Grubby Hug 'N Sing - Sings clips from "It's Your Birthday"
WORKING 1985 Teddy Ruxpin Mechanical Doll With The “Grunge” Tape! *read details*. Condition is Used. Shipped with USPS Priority Mail. Bear has been tested and works. Comes with the yellow grunge tape as shown! There are a couple spots on his clothing and some spotting and fabric missing on his nose. Batteries will not be sent. I have also listed Teddy Ruxpin with tapes, books and outfits listed. World of Wonder Grubby WITH CORD! This is in very good condition, not sure if it works was not able to test it. Other than a little dusty from storage this is in excellent condition. The top and the bottom of the box have wear and tear. Book pages look excellent and the tape looks pretty much unused. Be sure to take a good look at all the pictures so you can see exactly what you're getting. Vintage Original Teddy Ruxpin Grubby Lot of 3 1998 1985 Lullabies Airship cassettes included. Older teddy still has tags. Condition is Used. These are untested battery compartments clean. Shipped with USPS Priority Mail. Teddy Ruxpin 1985 Metal Cassette Tray WORKS! For the most part, Teddy works great, but sadly, the bottom of his mouth doesn't move. Other than that, he is in great condition, no rust or corrosion to be found. Feel free to buy multiple! This is a power kit for all World of Wonder 6 volt toys. The list is huge but includes Teddy Ruxpin, Grubby, Mickey mouse, Goofy, and Snoopy. This kit will fix corrosion in battery box. Plus this product eliminates batteries for life of toy. Condition is Used. Includes original box, instructions/manual, growth chart, speaking baby Teddy Ruxpin (mouth moves, eyes do not). Note this version does not take cassette tapes. Sold as pictured. ONE BOOT MISSING FROM THE GREEN OUTFIT. SEEMS TO BE IN AVERAGE TO GOOD CONDITION FOR AGE. You are buying as is. I don't know much about this as it was part of an estate. WHAT YOU SEE IS WHAT YOU GET. Untested as I do not own any of the cassette tapes. SOLD AS IS. Includes original Instructions. Does NOT Include REELS or CASSETTES. Condition is Used. Teddy Ruxpin is working with functional cassette tape player, sound, moving eyes and mouth. (4) C batteries NOT included. Overall good condition. The Tuxedo is excellent. The tan top has stains. Hard Back - Lightly Used. Condition is used. Box is not mint at all shows severe wear. The animation works and the tape plays. It takes a few seconds before he starts talking. The animation is not quiet either. You can hear the gears. 1985 ORIGINAL TEDDY RUXPIN COAT AND HAT IN EXCELLENT CONDITION. This is one of the hand puppets produced in 1986 by Worlds of Wonder from Teddy Ruxpin. Would make a wonderful addition to your Teddy Ruxpin puppet collection. This teddy is cute. It does not have the transmitter, and cannot be tested. He needs batteries. Never opened. Edges are bent in places and there is shelf wear. Teddy Ruxpin. This is a 1989 projector by Worlds of Wonder for use with the Teddy Ruxpin bear. -Picture Show -. Good luck! Brown plush teddy bear with ivory plush on bottom of feet and snout. Brown plastic eyes and black plastic nose. Pink vinyl tongue on lower jaw. Wearing a red shirt and shorts and a beige plush vest with logo on the front. Played with good condition. I'm not skilled in this area. What you see in the pictures (taken inside a LED light tent) is what you will receive (except for the Arizona quarter, which is only to give you a sense of scale). I'm always adding new things. Vintage Teddy Ruxpin Book LOT of 4 - no tapes. The doll does play and reads through the stories, however his mouth no longer moves. Doll is in mint condition as shown. Takes 4 "C" batteries. Tested and tape player works! I did not see the eyes or mouth moving while tape was playing. Teddy Ruxpin AND Grubby - No Cord w/ Answer Box & 2 Tapes & 2 Books - THEY WORK! Teddy Ruxpin AND Grubby - No Cord - w/ Answer Box & 2 Tapes - THEY WORK!. You get the items as seen in the pictures. Everything is in great used condition. A few marks on Teddy’s vest. Teddy works. *I don’t know how Teddy’s and Grubby��s eyes work. * Grubby worked the last time it was used. No cord for him. The answer box works. Plugs into Teddy. Both Teddy and Grubby have extremely clean battery compartments, and so does the Answer Box. Look at pictures for condition. Shipping will be combined on all purchases! Check out my eBay store for more Vintage Toys and other various items! If you have any questions, please feel free to ask! 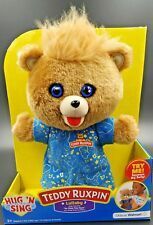 Bramd new 2017 Teddy Ruxpin, the storytelling animated bear! Brand new, factory sealed, and in good shape without heavy shelf wear. This one in particular is the Target Exclusive that has Teddy is his original outfit liie he wore back in the day!Free priority shipping in a sturdy box! UP FOR SALE IS ONE PREOWNED PREVIOUSLY USED THE WORLD OF TEDDY RUXPIN BOOK-N-TAPE ALONG. THIS ITEM HOLDS 6 CASSETTES AND 6 BOOKS AND IS RARE AND HARD TO FIND. ITEM HAS BEEN USED AND IN VERY GOOD CONDITION FOR IT'S AGE. Teddy Ruxpin is an animatronic storytelling toy bear that comes with an actual book that a child is able to read along with. Teddy was originally introduced in the 1980s, and later versions offered different looks and read-along options. The bear's eyes and mouth move while the story plays so that children can feel like the bear is reading the story to them. What is the history of Teddy Ruxpin? Originally marketed in 1985 as an animated talking friend, Teddy Ruxpin featured a moving mouth and eyes that simulated him reading a storybook to a child. 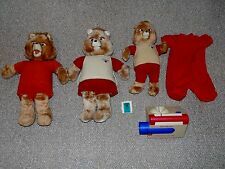 Teddy wore a red outfit with a tan vest and had a slot on his back for cassette tapes for each story to be loaded into. Worlds of Wonder was the original manufacturer, but several other toy brands have bought Teddy's rights and released new versions over the years. Wicked Cool Toys is one later manufacturer. In 2017, it released a version of Teddy that features LCD eyes and the famous moving mouth. What are some of the other characters in the books? Several characters who made single or recurring friend appearances in the storybooks include Grubby, Newton Gimmick, Leota the Woodsprite, Tweeg, Princess Aruzia, Grunges, and Wooly. An animated TV show aired in 1986 and 1987 and had a few extra characters aside from the ones in the storybooks, including Quellor the leader of Monsters and Villains Organization (MAVO) and the Gutangs. The stories take place in the lands of Grundo and Rillonia. What were some companion toys to Teddy Ruxpin? Worlds of Wonder also manufactured a talking Grubby toy that could interact with Teddy Ruxpin when the toys were connected to one another. Smaller dolls and action figures of Teddy and several of his friends are also available. What are some of the features of Teddy Ruxpin dolls? Some of the late 2010s-era stuffed animals manufactured by Wicked Cool toys have the signature look of the 1980s era toy, including his moving eyes and mouth. These Teddy Ruxpin dolls also have several technological features. Rather than using cassette tapes for the storybooks, the toy bear contains a story collection internally and has control buttons in each paw that allow kids to control which tale Teddy tells. A sing-a-long mode is also available, and a companion mobile app takes the place of printed books for reading along. Content provided for informational purposes only. eBay is not affiliated with or endorsed by Teddy Ruxpin or its manufacturers.